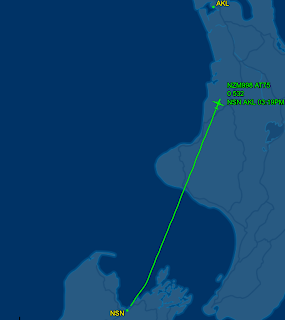 Enroute to Auckland for delivery to Air Chahams this afternoon was ATR 72-500 ZK-MCO using callsign Mount Cook 998. From the Air Chathams' newsletter, Air Chathams has purchased an ATR72-500 to undertake scheduled tours in New Zealand for Tauck Tours. We have secured the contract for these services and are delighted to see the aircraft in our colours with the familiar Chathams Islands logo on the tail. The aircraft, ZK-MCO, will be based in Auckland with charters due to begin in February 2019. The first flight under Air Chathams colours will be on the 8th of February from Wellington to Blenheim. It will not currently be used for Chatham Islands or Norfolk Island flights. "Air Chathams has purchased an ATR72-500 to undertake scheduled tours in New Zealand for Tauck Tours. We have secured the contract for these services and are delighted to see the aircraft in our colours with the familiar Chathams Islands logo on the tail. The aircraft, ZK-MCO, will be based in Auckland with charters due to begin in February 2019. The first flight under Air Chathams colours will be on the 8th of February from Wellington to Blenheim. It will not currently be used for Chatham Islands or Norfolk Island flights. For those less familiar with aviation spotting, the ATR is a twin-engine turboprop, short-haul regional airliner developed and produced in France and Italy. It has a seating capacity of 68 passengers. We welcomed the aircraft to Auckland on Thursday 24th of January 2019." Is MCO on a dry, damp or wet lease or has it been 'purchased' by Air Chathams?. The CAA aircraft register is still showing that MCO is still owned by Mt Cook Airlines. Will the Tauck Tours flights operate year-round? I thought they were summer only. If not, what will the plane be used on for the rest of the year if not CHT or NLK (I assume PPQ and WAG loadings aren't high enough to justify it)?